A pretty addition to any party table, or a lovely gift to take to your hosts if you’re invited round for a meal (which is what I made them for). They are easy to make, they just take a bit of care and patience. – Jam with no bits in for sticking the fondant onto the shortbread. – 1 teaspoon vanilla essence (the lemon zest adds a subtle lemon flavour, if you wanted a more intense lemon flavour you could use lemon essence rather than vanilla essence here). 1. 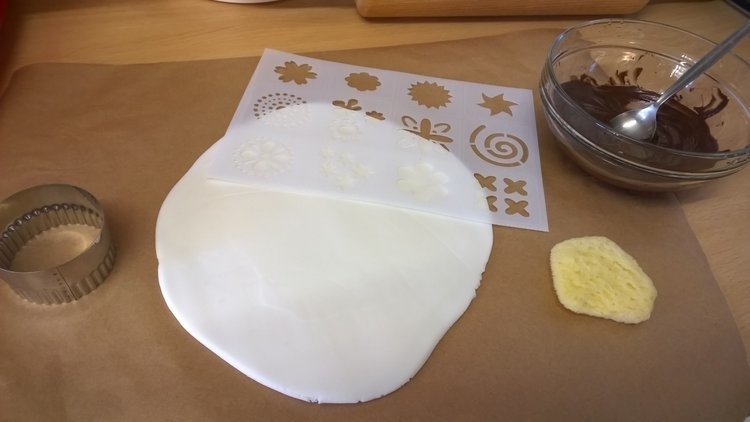 Roll out the fondant until it is about half a centimetre thick (I rolled it between two sheets of baking paper). 2. Melt the dark chocolate. 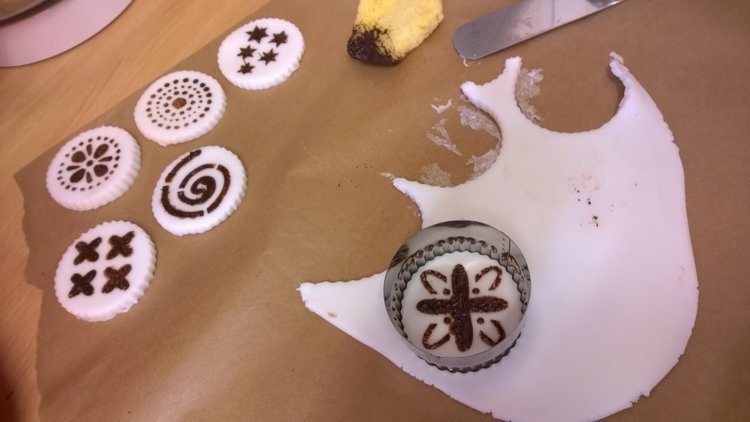 Lay the stencil shapes on the fondant, dip the sponge in the chocolate, wipe the excess off on the side of the bowl, and dab the chocolate over the stencil shape. Remove the stencil and use the fluted cutter to cut a circle around the shape. Repeat. Gather up and re-roll the fondant as needed. 3. Beat the butter and sugar together until pale and fluffy. 4. Add the lemon zest and vanilla and mix in well. 5. Add the sifted flour and begin working it in with a wooden spoon, then switch to using your hands to bring it all together until it is firm and rollable. 6. Sprinkle a little caster sugar on your work surface and roll out the shortbread until it is about half a centimetre thick. 7. 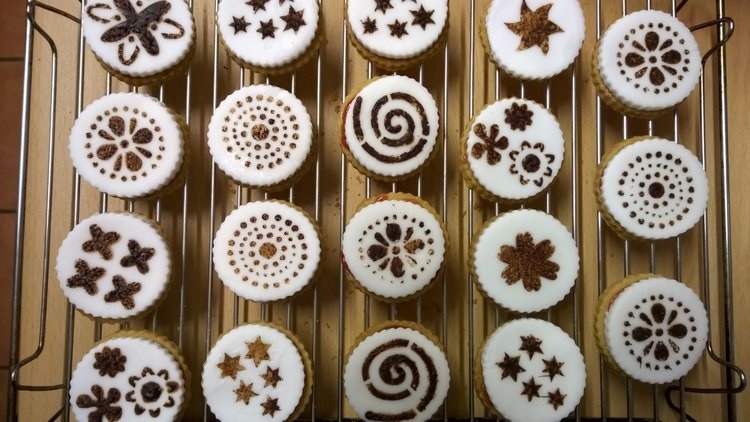 Using the same size cutter as you did for the fondant, cut out the rounds, gathering and re-rolling as needed. 8. Place the rounds on a baking sheet lined with baking paper (they keep their size and shape during cooking, so can be fairly close to each other on the sheet). Put into a preheated oven 150C/300F for about 25 minutes until they are crisp. They will develop a small amount of colour only. Cool on a rack. 9. 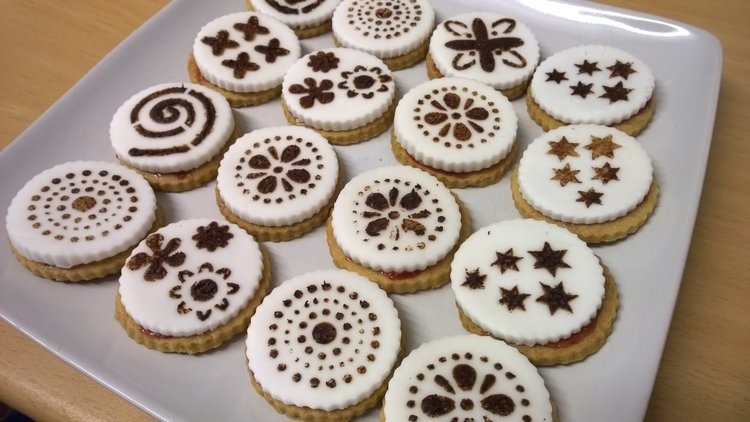 When the shortbread rounds are cooled, spread jam on to them and place the fondant on top. As an alternative to jam, you could use more melted chocolate to stick the tops on. Store them in an airtight container. Last night PBS was showing The Great British Baking Show. Actually, I only watched half of it because it was making me hungry and I was about to go to bed and didn’t want to have to eat something. But they were making Swiss rolls with all kinds of fancy decorations on top. I kept thinking, where is Vanessa? Why isn’t she here? She’s a plenty good enough baker! She’d win hands down! Couldn’t you just beam yourself here and make me some? Excellent. Just going to sleep but when the door bell rings I will come running! Don’t those designs upset your whateveryoucallit? Nope, my whatevericallit is fine with these! Yes, those still look scrumptious, even those several days have passed since I saw them on Facebook. 🙂 Do you think a bit of lemon curd would work in place of the jam for bonding the cookie and fondant? I’m thinking that’s another way to ramp up the lemon quality…. Oh yes, lemon curd would be better! Great suggestion, if I do them again, I’ll use that. I love shortbread, and I like JMs suggestion with the lemon curd. Fun recipe!